Wyandotte County – Page 1371 – Welcome to Wyandotte Daily! In the primary election Tuesday, Aug. 2, Bill Hutton and Donald G. Terrien are running for the Kansas Senate, 5th District Democratic nomination. Both candidates agree that education is a top issue, but they have different methods of increasing state revenues to fund schools. 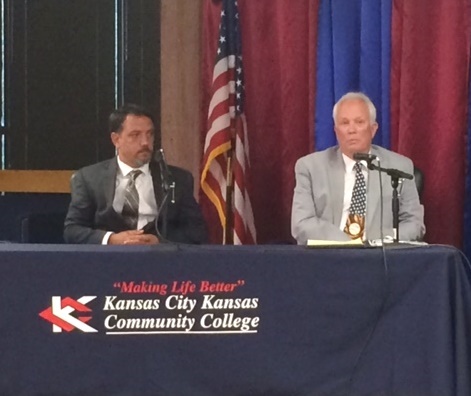 The candidates appeared at a forum July 12 sponsored by Business West, neighborhood business organizations and Kansas City Kansas Community College. The 5th District includes parts of western Wyandotte County and Leavenworth County. The incumbent is Republican State Sen. Steve Fitzgerald. About 60 percent of the district is in Leavenworth County and 40 percent in Wyandotte County. Hutton, of Basehor, Kan., has been an attorney for 36 years in Kansas City, Kan., and a part-time municipal judge in Bonner Springs for 14 years. He also was a municipal judge in Kansas City, Kan., for three years. “I’m running for the state Senate because of the failed policies of Gov. Brownback, and the votes and the actions of his ardent supporter, the current one-term incumbent in Senate District 5,” Hutton said. He said he favors local control over issues ranging from property taxes to gun control, and he opposes unfunded mandates from the state. He supports equitable funding of the public schools, and he does not support a constitutional amendment that would limit the powers of the Kansas Supreme Court, he said. Terrien, 41, of Lansing, Kan., said he has been a member of the working class for 20 years. He pays taxes every year, and he thinks it’s ridiculous some of the things he’s seen that happen in the state. He said education is an important issue. “I’ve had enough so I figured I would try to do something about it,” Terrien said. He said that legalizing marijuana could produce more tax revenues that could be used for education. Terrien also is a supporter of gun rights, and believes the sale of cigarettes should be illegal. Hutton said projects that received sales tax revenue bonds here paid significantly more in property taxes than had been paid previously. With the payoff of the STAR bonds on Village West, more sales tax revenues are coming into the community. “What we’re seeing is a major increase in the funds from sales tax that will go directly to Wyandotte County, and to the community college and to the school district to reduce property taxes,” he said. Terrien said he thinks the property tax is outrageous currently the way it is now. “There’s some states that have legalized marijuana, with all kinds of tax revenue,” Terrien said. He said he thinks Kansas should legalize marijuana. “In order to increase funding for schools, we’ve got to do something drastic,” Terrien said. On the issue of the property tax lid, Hutton said the state Legislature always says the federal government shouldn’t tell the state government what to do, and by the same token, the state shouldn’t tell local governments what to do. The local elected officials in Wyandotte County should be able to determine what appropriate taxes are, he said. Voters can vote them out of office if they don’t agree with the decision, but Hutton doesn’t believe the state should impose a property tax lid on local governments. Hutton said he is not in favor of legalizing marijuana. If there are medical exceptions under medical supervision, that’s possible, but it is not a quick fix for the budget, and he doesn’t think that’s how Kansas should support its schools. On the question of the Dream Act, Hutton said he supports it. The students who are affected are those who have been here since they were small children and have graduated from high schools. He said they need to have the same opportunities as other residents to get a higher education. He said he would support their ability to get student loans the same as any other resident of Kansas, as they should be on the same basis as other citizens. Kansas needs to revisit its corporate tax structure, as well as revisit the issue when the state reduced its major sources of revenue from three to two, he said. Terrien said if there isn’t money to support the Dream Act students, there’s nothing they can do. “We can’t just give out money to everybody and expect the budget to be perfect, because it’s just not going to happen,” he said. Since the students have lived here so long, they should qualify for the same grants that everyone else receives, he said. On the question of increasing the amount of the slots revenue that The Woodlands would be able to keep, which was in a bill proposed by Sen. Fitzgerald, Hutton said any change to the 2008 law would require close scrutiny. He said with this bill Sen. Fitzgerald was not looking out for the best interests of the citizens of Wyandotte County, of the three cities in Wyandotte County, nor of all the school districts in Wyandotte County. Hutton said he is in favor of The Woodlands reopening as long as it is a fair and level playing field with other casinos that are already in Kansas City, Kan.
Terrien said his top issue is education. He said some of the school districts are falling behind and some school programs have been cut. “If you do something like legalize marijuana, it’s going to bring in so much tax revenue that some of these programs can open up right away, and some of these falling behind schools can actually get more funding to bring them up to par,” Terrien said. Hutton has been endorsed by the political action committee of the KNEA, Mainstream Coalition, Tri-County Labor Council and Kansas Families for Education. “My job is to listen to my constituents and do everything I can to make sure their needs and wants are addressed,” he said. To view the candidate forum online, visit https://www.youtube.com/playlist?list=PLMfeRPiOepX3iQS-Y5OCca80njs3sop8W. The forum is being shown on KCKCC’s cable television station. To see a schedule, visit http://wyandottedaily.com/candidate-forum-to-be-shown-on-kckcc-cable-channel-2/. To see Terrien’s responses to the Women for Kansas questionnaire, visit http://womenforkansas.org/donald-terrien/. To see Hutton’s responses to the Women for Kansas questionnaire, visit http://womenforkansas.org/bill-hutton/. An injury crash was reported at 3:06 p.m. Sunday, July 31, at State Avenue westbound, west of I-435, according to a Kansas Highway Patrol trooper’s report. A Nissan Altima was stopped at the stop sign on the I-435 southbound ramp to State Avenue, according to the trooper’s report. A Dodge Ram 1500 was westbound on State Avenue, and struck the Altima. The driver of the Altima, a 25-year-old woman from Kansas City, Kan., was injured and taken to a hospital, the trooper’s report stated. A 24-year-old Kansas City, Kan., woman in the Altima had a possible injury, the report stated. The report said a 3-year-old Kansas City, Kan., girl and a 5-year-old Kansas City, Kan., girl in the Altima also had possible injuries and were taken to the hospital. The driver of the Dodge pickup truck, a 17-year-old male from Bonner Springs, had a possible injury, the report stated. In the Democratic primary on Aug. 2, incumbent State Rep. Kathy Wolfe Moore, D-36th Dist., faces opposition from Gwendolyn Thomas. Both formerly worked in the mayor’s office at Kansas City, Kan., City Hall, although under different administrations. 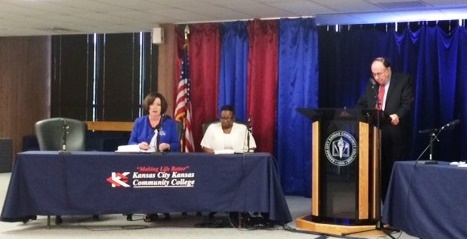 Both were at a candidate forum July 12 sponsored by Business West, business neighborhood organizations and Kansas City Kansas Community College. Rep. Wolfe Moore has served as state representative since 2011. She serves as ranking minority member of the General Government Budget Committee, and serves on the Appropriations Committee, Taxation Committee, Joint Committee on Special Claims against the State, and served on the 2015 Special Committee on Taxation. Since 2005, she has been the business director for the University of Kansas Hospital in Kansas City, Kan.
Rep. Wolfe Moore has over 20 years of community service. She was the chief of staff for former Mayor Carol Marinovich for 10 years, and helped with recruiting key businesses to Village West, as well as helping to create a network of neighborhood organizations. She has served as chairman of the board of the Wyandotte County Economic Development Council and board member of the Wyandot Center. She also serves as a state director of Women in Government. She is a graduate of Bishop Ward High School, holds a bachelor’s degree in social welfare from the University of Kansas and a Master of Social Work from KU. In her campaign announcement in March she talked about working together across party lines to achieve results. Because of the state’s tax plan, the state is starving mental health, schools, universities, senior programs, and not making necessary payments to the state’s retirement system, KPERS. “We have to change this,” Rep. Wolfe Moore said. Thomas, who serves as vice chairman of the Wyandotte County Central Democratic Committee, is the former professional assistant to former Mayor Joe Reardon, and the former administrative assistant to the Unified Government commissioners. She said being a part of that administration has resulted in knowledge of the nation, state and local governments. A Bishop Ward High School graduate, she currently she is completing a bachelor’s degree in organizational communication at Park University. She has been an active volunteer for the Heart of America Veterans Stand-Down, Boys and Girls Clubs, Providence Hospital’s Gala, the Kansas City, Kan., Area Chamber of Commerce, Convention and Visitors Bureau, Mt. Carmel Redevelopment Corp and other groups. Thomas is in favor of school funding and equality, increased public safety, access to mental health programs, a decrease in Medicaid cuts, and preservation of neighborhoods. “I want to bring about change,” Thomas said, adding that she was the only one who could bring about change. The governor’s tax plan was supposed to create jobs and bring jobs to the state of Kansas, but anything but that has happened, she said. Job growth and personal income growth is down, she said. Thomas said the state would have to get back to the basics, figure out how to bridge the gap, and make the community more involved in the process. Even though the Republicans created the mess, the Republicans got the state out of the school finance mess recently, she said. She will support the purpose and mission of Democrats, but said if Democrats and Republicans work together, they could accomplish a lot. Thomas said she believes funding should be increased for public education. Wyandotte County is considered to be an impoverished area. “It’s desperately needed,” she said. She said she is paying for her own tuition to get a degree at college, and if some kind of assistance was available, she would love that aid. Rep. Wolfe Moore said the equity portion of the school finance issue was tackled successfully in a special session, and it was reassuring to see the Democrats, Republicans, moderates and conservatives come together to do it. “I just hope that that’s a sign of what could happen in the future,” she said. If the Supreme Court rules the schools are not adequately funded later this year, it will be something that the Legislature will have to address, she added. Colleges and universities are victims of the tax plan, and universities and colleges have had to raise their tuition, she said. “People are being squeezed out,” Rep. Wolfe Moore said. Now college and higher education are almost unaffordable, she said. Also, if Kansas tuition becomes too steep, the universities and colleges will stop attracting students from outside the state, and students who usually go to colleges here would choose other locations outside the state, she said. It all comes back to fixing the tax plan so Kansas can afford to provide the funds that are needed to keep higher education healthy in the state of Kansas, she said. In answer to a question, Rep. Wolfe Moore said she was not opposed to The Woodlands. Years ago everyone was sad when it closed, she said. However, it is a different time now, with magnificent development in the western part of the community, she said. She said she would like to see a development plan or some promises that will happen if that is developed. “The last thing I would want to see is sort of a shoddy, half-thought-out racino at The Woodlands. It has to be first class. It has to fit in with the rest of our community. If I could be assured that that was the case, I would absolutely be for it,” she said. Thomas agreed with Rep. Wolfe Moore on The Woodlands. “I could see The Woodlands as something that is beautiful, productive, state-of-the-art type convention center, something that would really get a lot of use and the citizens would truly benefit from,” Thomas said. Thomas said she would not support a change to the property tax lid that the state has put on local governments and school boards. “Our residents are already feeling the squeeze of the property tax,” Thomas said. Residents feel they are already paying high property taxes, she said. Rep. Wolfe Moore said she would support a change to the property tax lid law. She said work needs to be done locally on lowering property taxes in Wyandotte County. However, the state has imposed a lid on the local communities, taking the decision away from local communities. “We elect local commissioners and a mayor to make those decisions,” Rep. Wolfe Moore said. She did not vote for the property tax lid. The law requires local governments to put a tax increase over a certain amount to a vote of the people. She also said it was hypocritical of the Legislature to put a property tax lid in place, because the state legislators themselves voted in a sales tax without asking constituents. “I absolutely am for lower property taxes in Wyandotte County, but it’s not the Legislature’s decision, it’s the people that are closest to the problem, your commissioners, your mayor and your school board, that’s their decision, not mine,” Rep. Wolfe Moore said. When asked about the state’s cuts to mental health services, Rep. Wolfe Moore said she believes funding should be increased. She was given an award from the Association of Community Mental Health Centers in 2012 and 2014 for her work on mental health in Kansas. “It’s a travesty what we’ve done to mental health,” she said, including what has been done to community mental health budgets and to the state hospital. The Osawatomie state hospital has been a disaster, part of it was closed down and wasn’t able to recertify because of things that were going on, she said. “Absolutely we need to increase mental health services,” she said. Thomas said she believes the mental health service funding should be increased. She recently talked to a person who works in the mental health field for 20 years who decided to retire because she felt she could not provide the patients with the care they needed, as funds were being taken away. There needs to be access to mental health care for everyone who needs it, she added. Thomas said the budget crisis is one of the biggest issues that Kansas is facing. Schools may have to wait for funding, and she believes it is time to take care of the budget crisis. If not, it will be out of reach to change it. Rep. Wolfe Moore said the largest issues were the tax plan and budget, schools and Medicaid expansion. “Because we’re squeezing so many other budgets, we’re making some very inappropriate and costly financial decisions,” Rep. Wolfe Moore said. As an example, she cited a program around since the 1990s, the Senior Care Act, that provided monies for in-home services for seniors. That is the right thing to do, and it helps the state avoid the very costly amount of money they have to give if a senior had to go to assisted living or long-term care and they were on Medicaid, she said. But the program was severely cut. She voted against drastic cuts that were made to the Senior Care Act, she said. What has happened is that seniors wind up in assisted living or long-term care rather than in their home. It was a short-term fix for the budget, but in the long term it will cost the budget and state of Kansas taxpayers a lot of money, Rep. Wolfe Moore said. It’s crucial for Kansas to pass the Medicaid expansion plan, she said. About 150,000 persons in Kansas who don’t have insurance now will be covered, she added. That will help the economy, boost jobs, and help people have the health care they need, she said. It makes sense to have a person treated at a doctor’s office for high blood pressure rather than to end up in the emergency room for a stroke, she added. Rep. Wolfe Moore said Topeka has become more and more like Washington, D.C., and sometimes it seems like the Democrat and Republican dynamics are destroying the state. “I think we have to get a little of that out of the way, and be more concerned about what the issue is, and about the people we’re serving,” she said. She said she has worked very hard on these issues over the past six years. To see more of the comments, view the candidate forum online, and visit https://www.youtube.com/playlist?list=PLMfeRPiOepX3iQS-Y5OCca80njs3sop8W.